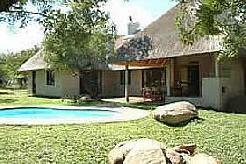 Khaya Umdani is a 4 star graded luxury self catering lodge situated in Marloth Park, a conservancy area with wild life roaming free amongst the houses. Marloth Park shares the southern border, the Crocodile River, with Kruger National Park. The towns Malelane, Hectorspruit and Komatipoort are all within half an hours drive from Khaya Umdani. Situated just 400 meters from the Crocodile River, Khaya Umdani guests can listen to the hippos, lions and other African wildlife while enjoying an evening barbecue. 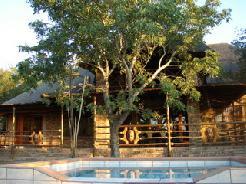 The lodge can accommodate 10 guests in 5 en suite bedrooms that are individually air conditioned. One of them has a spa bath overlooking the bush where one can view the animals. Spacious bedrooms are complimented by a very modern fully equipped kitchen. There are also 2 living rooms, one of which has a plasma TV, DSTV and DVD player. Dining areas, relaxation areas and bedrooms are all beautifully appointed with the added ambiance created by being surrounded by wildlife in their natural environment. All linen and towels are provided. 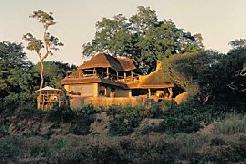 There are 3 restaurants in the conservancy within 2km from the Lodge. 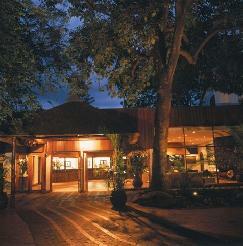 All of these restaurants offer a unique �African Bush� atmosphere. 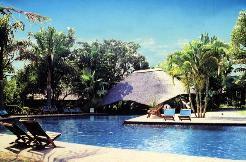 There is an outdoor splash pool to relax in during the warm summer months, a waterhole and 2 huge fire places. You can expect regular encounters with a variety of wild animals like kudu, giraffe, zebra and warthogs around the house. Activities in and around Marloth Park include game drives through the Kruger National Park and Lionspruit, hiking, scenic drives, white water rafting, elephant back safaris, hot air ballooning, day trips to Maputo, golf, cultural experiences and more. To the north-west of Marloth Park you�ll find White River, Hazyview and Sabie � all popular tourist destinations well worth a visit. Khaya Umdani is surrounded by excellent golf courses like Komatipoort (16km), Malelane Golf Club and Leopard Creek (rated number one golf course in South Africa and designed by Gary Player), (26km). 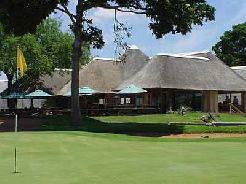 Skukuza golf course is 80km from Khaya Umdani inside the Kruger National Park. 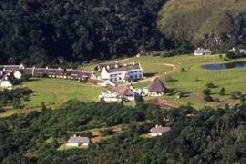 Nelspruit, Sabie River and White River Golf Courses are all within an easy drive from Khaya Umdani.